Calgary Acupuncture provides traditional chinese acupuncture and medicine for a wide variety of illness at health plus building, south east of Calgary, servicing Somerset, Brentwood, Midnapore, Evergreen, Sundance, Lake Bonavista, Parkland, Deer Ridge, Deer Run, Diamond Cove, Okotoks, High River or Douglasdale Estates areas . The web server with the IP-address 98.124.199.101 used by Calgaryacupuncture.ca is owned by eNom, Incorporated and is located in Kirkland, USA. 30 other websites are located on this web server. Most of them are provided in the english language. 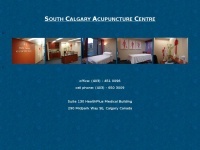 The websites of Calgaryacupuncture.ca are served by a Nginx server. The obsolete technology of framesets is used on the webpages. The website does not specify details about the inclusion of its content in search engines. For this reason the content will be included by search engines.